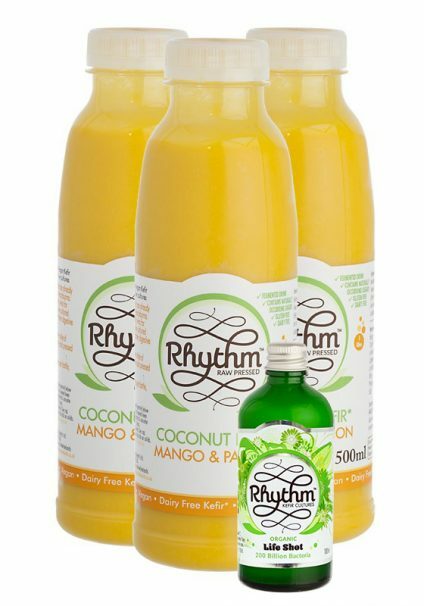 If you would like to upgrade to full 30 days after trying this just email us at sales@rhythmhealth.co.uk and we can send you a code. The Life Shot 200 is our highest grade coconut kefir and has been fermented the longest. This amazing Organic Life Shot contains 200 billion live, dairy free, kefir cultures raised in coconut, traditionally fermented with a natural synergistic order of microorganisms containing: Bifidobacterium, L.acidophilus, L.paracasei, L.rhamnosus and Sacchromyces Cerevisiae. Also contains its own pre-biotic coconut dietary fibre. Usage: Works well as a 5 day short course or as a more sustained 30 day course approach, flooding the gut every day with live fresh bacteria. For maximum effect we recommend taking a whole bottle first thing in the morning 15 minutes before eating. However if you prefer to spread the dosage out you can, the shelf life is 7 days after opening if kept refrigerated. Alternatively if you just want to turbo boost your breakfast it can be added into smoothies or other cold drinks. Twelve years ago I was an active, working, jet setting, gym going, mountain biking/swimming healthy woman. Sadly in 2005 overnight I awoke and was unable to walk, my symptoms were chronic inflammation which resulted in muscle wasting in my hands and calves, arthritis everywhere, widespread Raynaud’s disease (hands, feets, lips and nose), severe sinusitis, mild lung fibrosis and rapid and inflamed heartbeat and terrible fevers. I was very soon diagnosed with Mixed Connective Tissue Disease. For the last twelve years I have been on a number of immune suppressing drugs and many biological treatments together with steroids which have only helped somewhat but the side effects are horrific. I have spent many weeks in hospital and have always followed a healthy alkaline diet and tried everything under the sun including homeopathic treatments which has kept me afloat but still with severe symptoms/sleepless nights and a very limited lifestyle. 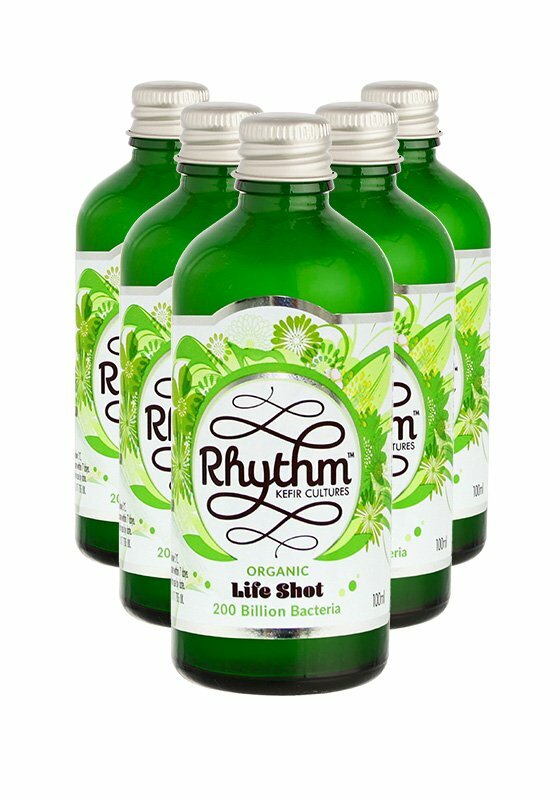 In the beginning of May 2017 I stumbled on the Rhythm Life shots at Planet Organics in London and after only 1 shot I could not believe how the systemic microwave burning feeling in my entire body which I have had all these years significantly reduced. After the second shot the following day I reduced one of my heavy immune suppressing medications (500mg of mychophenolate) that I have never EVER been able to reduce in twelve years. This is a miracle for me and what it will potentially do with continued use, I am therefore continuing to take daily shots and will update this review in due course. Anyone out there who has given up hope like I had you must try these shots along with a healthy diet as this has given me something to work for and hope for the future. This product was the only thing that managed to lower my SIBO levels! Amazing product – helped my digestion tremendously, Highly recommend. I came across this product initially at a health/food show and was impressed by its potential. I made a deal with myself to give it a try when I had a crohn’s flare up as I am loathed to go down the conventional medication route if I can possibly help it. This product, mixed with the small cleanse drinks definitely helped me after a very recent flare up brought on my a stressful string of events. I was in less pain after a few days and my stools were better. I also felt less unwell and exhausted in general. I have already recommended this to others who have acute gastro symptoms, even though it is expensive. I think it is worth the money. I also received excellent customer service. Having suffered a digestive fungal infection for many years I’m finding that by having a bottle of this each morning (and kefir and sauerkraut later on) I’m experiencing a bit change in symptoms for the better. It seems a fantastic product. And the way it is sent to you (hard cardboard, woolcool and frozen water bottles) is very impressive. I took The Life Shot over the 5 days and feeling less bloated, will be putting in an another order very soon.